For Dance and the Beauty of Age, Dances For A Variable Population welcomes four choreographers rooted in American Modern Dance and Broadway; Tina Bush (Forces of Nature), Shirley Black Brown Coward (Audelco Award, Black Nativity), Myna Majors (Baba Olatunji Drum and Dancers), and George Faison (Tony award, The Wiz). 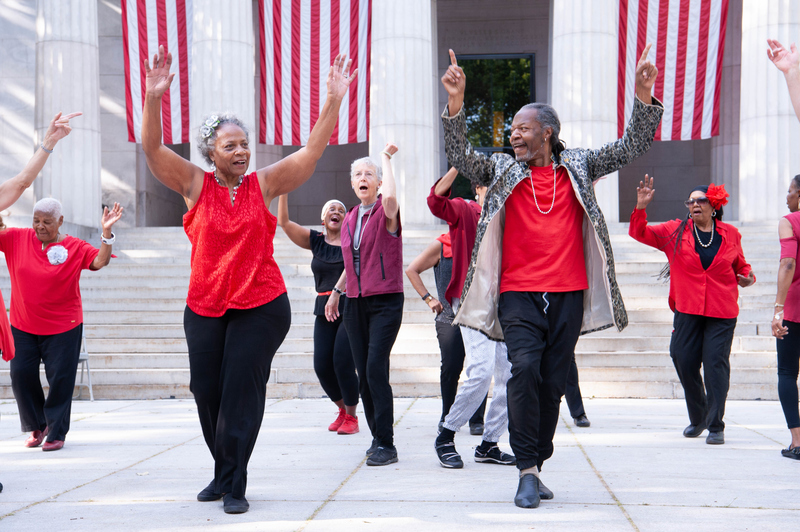 Dance and the Beauty of Age will also feature 25 seniors from DVP’s free Movement Speaks® programs in Harlem which take place at over 6 sites across Upper Manhattan. In a project of historical, social and technical exploration, Dance and the Beauty of Age celebrates the past performing careers of these artists and the impact these techniques have had on dance history and their lives. Through exploration across dance studios, libraries, senior and recreation centers in Harlem, Dance and the Beauty of Age will bring audiences the unique expression of older adults mixed with the power of older trained professionals. This one-of-a-kind event will be free to the public. It will provide diverse audiences an opportunity to see movement distilled from the seminal techniques of legendary geniuses, to see the eloquence of the older brain/older body, and to see older artists create. Performances will also include a public workshop for adults of all ages and abilities. Through this workshop, audiences including seniors and differently-abled individuals will dance in ways that are new to them, be stretched physically and intellectually, and gain new experiences of personal mastery. Take the A, D, C, B train to 125th St. and walk one block south to Hancock Place. The theatre is between St. Nicholas and Morningside Ave.
ABOUT DANCES FOR A VARIABLE POPULATION Founded in 2005 by Naomi Goldberg Haas, Dances for a Variable Population (DVP) promotes strong and creative movement among people of all ages and abilities with a focus on seniors. The organization’s programming includes: a multigenerational performance company that engages community members as participants and audiences; Movement Speaks® and Dances for Seniors, which are free, community-based programs for modest income and culturally underserved older adults, annually serves over 700 seniors; Variable Pop Method Expressive Dance and Fitness classes for adults of all ages, offered year- round; and performance and training opportunities for older professional dancers and choreographers. DVP’s site-related performances have been presented in some of New York City’s most iconic public spaces, including Times Square, the New York Botanic Garden, Washington Square Park, and the High Line. DVP has also performed at Jacob’s Pillow Dance Festival, and internationally in Poland and British Columbia. The development and performance of Dance and the Beauty of Age has been made possible with funding from the Upper Manhattan Empowerment Zone and administered by the Lower Manhattan Arts Council. UMEZ enhances the economic vitality of all communities in Upper Manhattan through job creation, corporate alliances, strategic investments, and small business assistance. LMCC empowers artists by providing them with networks, resources, and support, to create vibrant, sustainable communities in Manhattan and beyond. The project has also been made possible with support from the New York City Department of Cultural Affairs in partnership with the City Council, Columbia Community Service, the Mertz Gilmore Foundation, the Fan Fox and Leslie R. Samuels Foundation, the West Harlem Development Corporation, and M & T Bank. Join us for Revival 3 Rehearsals! Article in The Villager about Movement Speaks! Photos from Dance and the Beauty of Age! Ten years ago, Columbia pledged $76 million to local nonprofits. What happens when it runs out? We love this article from The Uptowner! Senior Planet Q&A with Naomi!